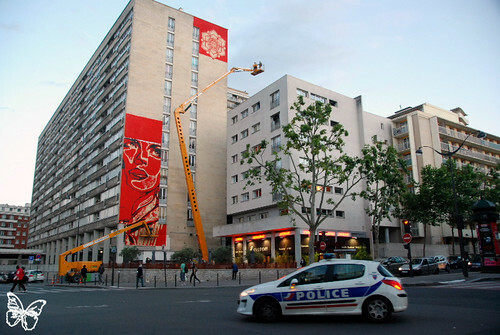 Following our earlier coverage of Shepard Fairey’s monumental mural in Paris ( see here), on day 2 the Obey Giant team starts working on the flower at the top right of the building. 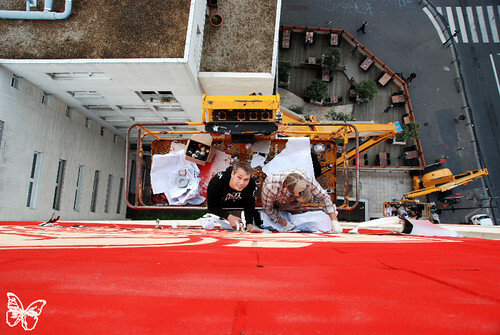 Having tried the cherry picker myself, it’s very windy specially at such height (40 meters high). Shepard Fairey, the Obey Giant team with Dan, Nick and Z, the organisers with Mehdi from Galerie Itinerrance, Jerome Coumet from Mairie du 13e, Butterfly as well as Mahmoud Belakhel, Ingrid Zeller, Matthieu Soudet, Romain Paget, Julien Hogert, Jonathan Ricquebourg, Rebecca Topakian, Pierre Bézard, Laura Fernandes, Maïa, Marouène, Valentine Poutignat, Julien Soudet, Felipe Quintelas, Fabio Caldironi, Kan, Sowat, Herve, Hugo Vitriani, Patrice Grellet, Philippe Langlois and the residents of the building. 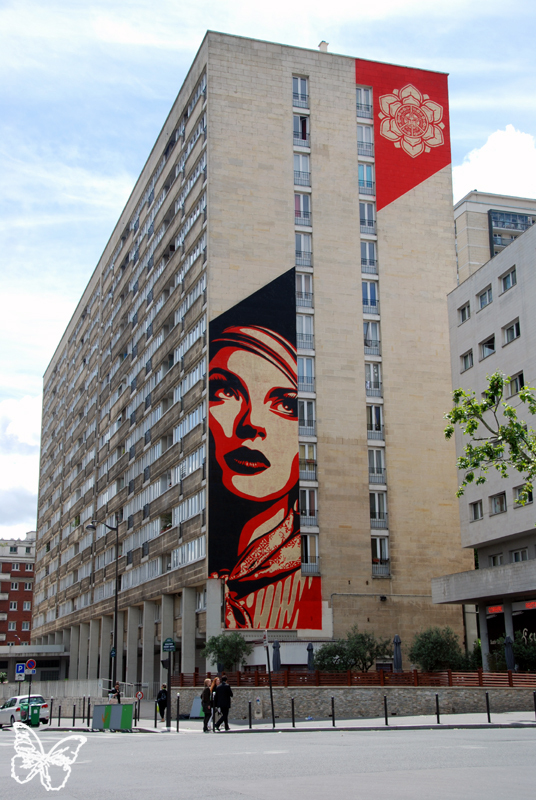 This entry was posted in Paris, Street and tagged Butterfly, Galerie Itinerrance, Mairie 13, Obey, Paris, Rise Above Rebel, Shepard fairey. Bookmark the permalink.